After her mother foretells an ominous future for her, darkness looms over Borte’s life. She becomes an outcast among her clan and after seeking comfort in the arms of an aristocratic traveler, she discovers he is the blood brother of Temujin, the man she was betrothed to years ago but who abandoned her long before they could marry. And he will only leave her behind again. Temujin will make Borte his khatun, his queen, yet it will take many women to safeguard his fragile new empire. Their daughter, a fierce girl named Alaqai, will ride and shoot an arrow as well as any man. Fatima, an elegant Persian captive, seeks revenge against the Mongol barbarians who destroyed her city and murdered her family, but in the end will sacrifice everything to protect the Golden Family. Demure widow to Genghis’ son, Sorkhokhtani positions her sons to inherit the Empire when it begins to fracture from within. So What Did I Think About The Story? 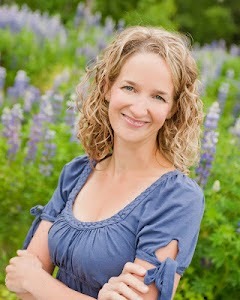 Stephanie Thornton has become an author known for bringing to life the nearly forgotten stories of exceptional and courageous women from ancient history and, in the process, has become one of my all time favorite authors. I always know when she comes out with a new book that I need to set aside as much time as possible to dive deep into the world within the pages because once I plunge in I won't want to come out! Her newest novel, The Tiger Queens, is no exception and I am still reeling from the story now that I am through reading it. While the most well known historical figure within the Tiger Queens is Genghis Khan, known to many armchair history buffs like me as a brutal conqueror who united many nomadic tribes into one unified empire and used vicious tactics and brute force to spread the boundaries of that empire to staggering proportions, the focus of The Tiger Queens is the women surrounding him who not only helped build that empire but keep it intact during his life and after his death. Ms. Thornton tells her story from the perspectives of four of these women: Borte, Genghis Khan's first wife and queen; Alaqai, their daughter; Fatima, a Persian woman captured when her city was destroyed by the Mongols; and Sorkhokhtani, wife of Genghis Khan's youngest son and the woman who would see the Empire continued when many others within this Golden Family would have caused its destruction. Using these four women as the storytellers not only gives a unique perspective to the life and conquests of this complicated historical man but advances the story across the years and lands of his rule in a delightful and unexpected way. They also make this terrifying man more human, showing him as a tender and understanding husband and a benevolent (if distant) father and father figure to his people. He is still the brutal warrior we all know but has a softer side I did not expect. While all four of these women are remarkable there are a number of admirable secondary female (and a few male) characters that could have easily shared their stories and demonstrated their influences on the Mongolian Empire (such as my all time favorite character, Toregene, a noblewoman who married the Khan's son Ogodei and was as detrimental to the story as any other). The bravery, sacrifices and spirit of each and every one of these characters served to highlight their power and ability in the face of so many hardships. Ms. Thornton's writing style is perfectly fitting for this world and the characters within it and her use of language and description are simply breathtaking. The reader is instantly on the steppes with the characters during the ferocious winters and searing summers and getting their hands dirty during the animal slaughters and on the battlefields. There is no shying away from the brutality of this world and this makes the reader feel that much more invested in the lives, decisions and actions of these women. I came away from the reading completely awed by their determination and endurance against a harsh and savage world. Within the grimness of their lives, however, is a bonding and camaraderie between the women that most people can relate to and which served to, again, humanize a world most of us would not be able to imagine. These women are real and flawed, showing ambition and jealousy but also love, forgiveness and an understanding of obligation above their own selfish needs. Remarkable is too small a word for these people and I am grateful to Ms. Thornton for bringing their stories into the light and refusing to let them be forgotten by history while also making their stories accessible to everyone. The Tiger Queens, like all of the author's novels, is a must read in my opinion. Combining historically accurate information about little known women (supported by the helpful author's note and cast of characters at the back of the book) with stellar storytelling to tie up the loose ends no longer known, we are once again able to witness the lives of people who set the foundation for what our world has become. I absolutely adore it! The woman could be any of the strong and proud women found in the story and seems to encompass all of the characteristics I imagined they would have (except maybe Fatima). Getting to see the beautiful clothes, breathtaking yet dangerous landscape and the tents they lived in really helped solidify what was already quite clear from the marvelous descriptions given within the story. And I love the wild horses running through the background, not only because they are a huge part of the story but because they could represent the wild spirits of these brave women. Thank you to Amy at Historical Fiction Virtual Book Tours for providing me with a free copy of The Tiger Queens in exchange for an honest review! Make sure to continue below for more information about the book, the author and how to enter to win a copy of your very own! she is at work on her next novel. “The Secret History: A Novel of Empress Theodora” and “Daughter of the Gods: A Novel of Ancient Egypt” are available from NAL/Penguin. 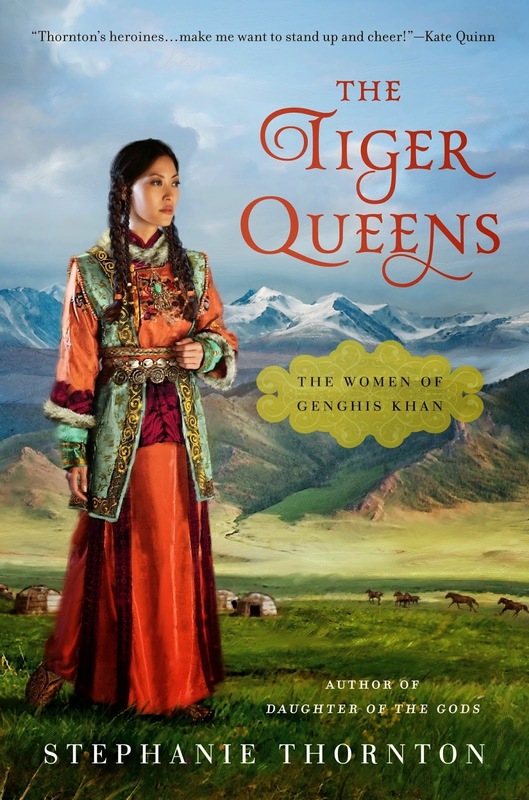 “The Tiger Queens: The Women of Genghis Khan” will hit the shelves November 4, 2014, followed by “The Conqueror’s Wife: A Novel of Alexander the Great” in November 2015. For more information please visit Stephanie Thornton’s website and blog. You can also find her on Facebook, Twitter, and Goodreads. For a chance to win a paperback copy of The Tiger Queens (U.S. only!) leave a comment below telling me what woman or women from history you would love to see the heroine of her/their own novel. Be sure to leave your email address (no email address/no entry!). For extra entries share this review/giveaway online and leave a separate comment with a link to where you shared. That's it! I'll pick a winner on November 25th and the winner will have 48 hours to respond to my email before I have to pick another winner. Good luck everyone! I have no good ideas which strong heroine I would write about. I love that Stephanie chosen women who most of us have never heard of! I do too, Allison! She is a wonderful author and the fact that she teaches her readers something new about a strong woman (or women) they most likely have never heard of makes it even better! Oh, I've never heard of Belle Starr but I'm off to look her up right now. Thanks Deanna!! A heroine from history? How about Elizabeth Cady Stanton? Forget the Tudor Court, bring on the Seneca Falls Convention! It's an idea...albeit half-baked at present. "Check out this excellent, in-depth book review & feature on the Tiger Queen Book Tour, plus giveaway @HistoryTapestry http://goo.gl/LxeblR"
Thank you so much, Kara!!! Elizabeth Cady Stanton is another woman from history I have never heard of but I'm off to find out more. And thanks for the tweet!!! I love the cover. This book sounds quite good. I have seen it on a number of blogs. Very nice review. I love how you ask questions and have the answer below it. I'd love to read about Harriet Beecher Stowe. That's a good one, Lady Bibliophile! I am going with Catherine De Medici. There is plenty of information about her to write several books. Oh yes, Raquel!!! There are so many interpretations on Catherine De Medici - was she an evil poisoner, was she just a woman longing for love from a husband who flaunted his mistress in her face, etc. - she could fill loads of books! And the winner, using a random number generator, is (drum roll please)....KAS!!! Congrats KAS and I will be sending you an email right now for your mailing address. You will have 48 hours to respond to my email before I have to pick another winner. Thank you all for entering and enjoy your Thanksgiving weekend! !